Delikon is very pleased to be involved with supply electrical flexible conduit and fittings systems in our work with the global LNG industry. 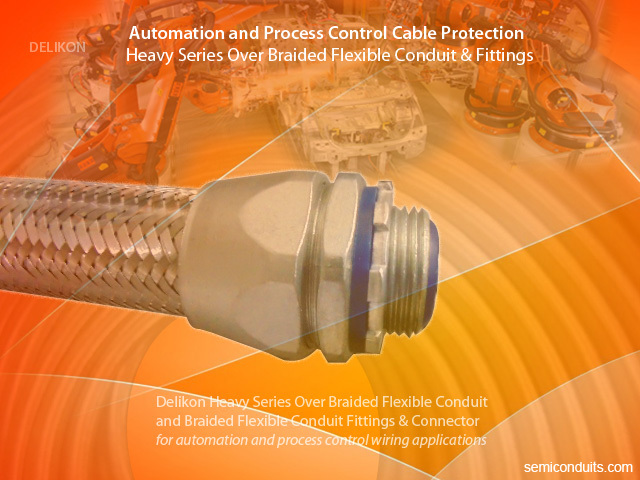 Delikon will supply its EMI Shielding Heavy Series Over Braided Flexible Conduit and Heavy Series Conduit Fitting for protecting instruments and equipment cables for FLNG facility being developed offshore. Experienced in the floating LNG market, Delikon delivers a comprehensive line of EMI Shielding Heavy Series Over Braided Flexible Conduit and Heavy Series Conduit Fittings for protection of electrical and data cables of integrated control safety system ICSS for the monitoring and control of the liquefaction facilities and storage tanks on FLNG facility. Delikon heavy series flexible conduit and fittings series are also ideal for catering to various requirements of the automotive industry. For example, the heavy series flexible conduit and fittings provide additional mechanical protection, hot metal splash resistance, as well as EMI shielding to automation control cables,arc welding line cables, and other automotive industry Automation electrical cables.The heavy series fittings have a metal clamping ring, providing positive clamping of both the braiding the conduit, as well as a termination for electromagnetic interference EMI shielding.